An American professor at a university in Beirut is captured by a militant faction and held in a tiny cell for three years. Back in the United States, his wife has "cleansed" his former office by removing everything from it. She spends most of her time there to share in his experience as much as she can. She is torn between a journalist intent to tell her story to the public and a State Department official who wants to keep her quiet. As events in the Middle East spin out of everyone’s control, everyone tries to do their best to manage the situation to bring Michael back to the United States, but each have their own interests at stake. The two rooms of Lee Blessing’s play are the barebones cell holding captive Michael Wells in Lebanon (actually, multiple cells, but they all seem the same to a blindfolded man) and his home office back in the U.S., which his wife Lainie has stripped clean of furniture and completely repainted. 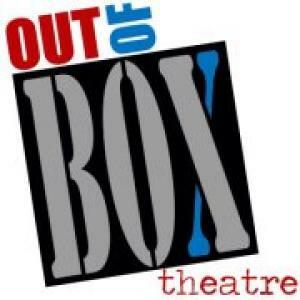 The tiny stage at Out of Box Theatre represents the two rooms in a single space, bounded on either side by projection screens and represented by a rectangle of wood flooring on which a blood-spattered pallet rests. The audience is split into two sections, with the stage between them. Pre-show video shows time lapse photography of nature (clouds, flowers, etc.) on the two screens. Video segments throughout the play show similar time lapse sequences, along with memory scenes of Michael and Lainie’s marriage (filmed by Wesley Channell) and documentary footage. This adds some visual interest to a pretty static play, but it doesn’t always resonate. There are times when it seems that the script and the images are supposed to be synchronized, but aren’t quite. In general, the video tends to extend the running time of a longish show. John Cerreta’s score can’t compensate for this, as somber as it is. Director/set & lighting designer Joel Coady has blocked the show so that most scenes are done in profile, allowing both sides of the audience to get at least a partial view of the action. Most sequences are monologue or dialogue, so stage clutter isn’t often an issue.